Do you struggle with what to wear every day? Is it time to organize your closet? Me too! The process of eliminating the items in my closet that were simply providing visual clutter and no joy to my life allows me to choose my daily outfits FASTER and to feel more organized. These hangers have been the main tool that helped me organize my closet. Why? You see, prior to my decision to organize my closet, my clothing hung on a variety of plastic hangers. Because they varied in thickness, shape and colour, it made my closet look disorganized right from the start. There’s another reason why I love my new velvet hangers – read about it below. I’ve always wanted matching hangers. I’m not sure why it took many years for me to make the big switch, however now that I have my new velvet hangers, I am so happy! They literally keep every single shirt I own ON the hanger, instead of falling off and landing on the floor. It also means that when my amazing daughter helps out by hanging laundry, I feel so appreciative as the job gets done with the end result being shirts ON hangers. Another type of hanging item that helps to organize your smaller items like scarves is one of these accessory hangers. When it comes to organizing your drawers, the konmarie method of folding looks SO NICE, but I struggled keeping up with it. These type of drawer boxes help to organize your socks and underwear without going to the extra effort of folding them in a special way. I’ve always been a big fan of fabric boxes. We use these in my son’s room to help (help being the key word) him organize his belongings. They would also go well inside a closet for items like extra purses, travel accessories and more. For the men (or little men) in your life, OR if you are a woman who loves her hats, organizing them on the back of your door helps to keep their shape as well as allowing for quick choices. We definitely can’t talk about organizing closets without the discussion of shoes. If I had more room in my closet, I would love to have something like this that hangs with drawers. Some people that I know also have a storage system for their out of season clothing similar to the systems below. Empty It Completely – this method requires a lot of time in one day. Empty your entire closet and assess each and every item as you put it back or place it in the discard pile. Turn Around Hangers – with this method, you turn all the hangers one direction and when you wear an item, you turn the hanger around. After a month, assess which items have not been worn and think about WHY. If you decide an item doesn’t serve you any more (because it doesn’t fit, you don’t like it or it’s too worn), put it in the donate or garbage pile. 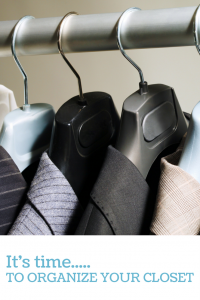 How often do you organize your closet? Tagged clean closet, closet organization, clothing. Bookmark the permalink. 7 Responses to It’s Time to Organize Your Closet! Wow,these are great tips and sure to come in handy ! That’s wonderful, Kathy! When was the last time you cleaned out or organized your closet? I go through my closet every other month,it’s gets messy really fast! I need to remove everything and organize new!